Canadians are worried about their retirement and rightly so. Science has backed it up. A report on senior’s finances from the Broadbent Institute produced several staggering numbers. One of them was half of Canadians aged 55 to 64 who don’t have an employer pension have less than $3000 saved up for retirement. Only $3000? WOW. Most of my millennial friends and co-workers see such numbers and suffer from an anxiety attack. Now, I have two problems to solve. As a nurse, I have to figure out to deal with my anxious buddy. As a personal finance blogger, I have to let my buddy know these numbers are extreme. Being a millennial myself, I know the biggest advantage we have is time and I make sure my friends understands this important ace we have in the back of our pocket. However, if we fail to take advantage of it and keep postponing our retirement goals – you will have less than $3000 in your savings come retirement. How to get started with retirement saving? Lots of millennials are in debt especially credit card debt. Again, research highlights this trend. In fact, this study done by Manulife Financial last year proves thirty-one percent of millennial respondents feel it’s not a “big deal” if they carry a balance on their credit cards. I have zero cc debt but I know friends that have huge cc debt and don’t know what to do with the debt. Some are perplexed if they should save first or try to slash off the debt. The banks are giving us an egg for saving our money with them. Don’t let your hard earned money lose value to inflation by giving your money to the bank. Sure, you can earn 2.25% with EQ bank’s savings account. Also, you can expect 6 or 7 percent growth in the stock market but it is not guaranteed. What is guaranteed is paying off your CC debt. Does it make sense to put your cash in a high-interest savings account that will help you earn 2.25% like EQ does but have debt on your credit card which might cost you 19.99% per year? DUH, of course not! Put your savings on hold and attack your debt first. Don’t let the credit card companies’ needles enter your arm and allow blood donation to begin. The 19.99% interest is poison, my friends. So, the first thing I would say is always attack your debt first especially if it is CC debt. After the cc debt is dealt with, I believe the best way to save for retirement is to automate the process. You can easily set up an automatic transfer to your registered retirement savings plan (RRSP) or tax free savings account (TFSA) every time you get paid. Heck, start with $25 a month if you have to which is how I started. As millennials, we need to use time to our advantage and start early. Personally, I have been investing with TD Bank’s e-Series index fund (Fund code – TDB900) for seven years now using the automation process. I started investing $25 every month. Then, I increased it to $50 every month. Today, I invest $100 bi-weekly to my fund, which is under my TFSA. Of course, I will increase my contribution gradually like I have done in the past and I don’t plan to touch this money till retirement. Canadian banks are one of the best asset classes that can get you started if you are a newbie investor. Sure, banks annoy us and sometimes trick us as customers but as a shareholder, it is a different ball game. I am telling from personal experience. Many Canadians are not taking advantage of pension plans offered by their employers. I always scratch my head when I hear this. How dare you give up free money? For instance, if you put in $1500 – you would receive a matching $1500 contribution from you employer. If you work in the health care industry like I do in Ontario, you should be eligible for Healthcare of Ontario Pension Plan (HOOPP). For every $1 that you contribute, your employer currently contributes $1.26 to your HOOPP Fund. Yum. Some of my co-workers put in nothing and they receive nothing from our employer. My plea: Please stop leaving free money on the table. This is a great opportunity to boost your savings. More importantly, you can take advantage of lower management fees and investments that would not be available to individual investors. I was fortunate to interview the CEO of HOOPP in March and he told me this – “HOOPP’s investment cost is .2% where as most individual running individual accounts will have to pay closer to 2% so that difference over the life of the plan will have a huge difference in net outcome. Now, when you do the math on that even if you do earn the same return, which you probably wont, you will end up with a pension half the size. So, it’s very important to be in the plan and it is one of the best plans out there”. My Treat: Plus, I believe it is essential to register your account online with Canada Revenue Agency (CRA) if you have not. CRA has multiple tabs when you login into your account. One of them is tax returns. You can check your tax information slips such as your T4 from previous years. Likewise, you can check the status of your tax return from previous years. The box will tell if it has been assessed or not. Or, not received. My account says I didn’t file my tax in 2010. Opps. 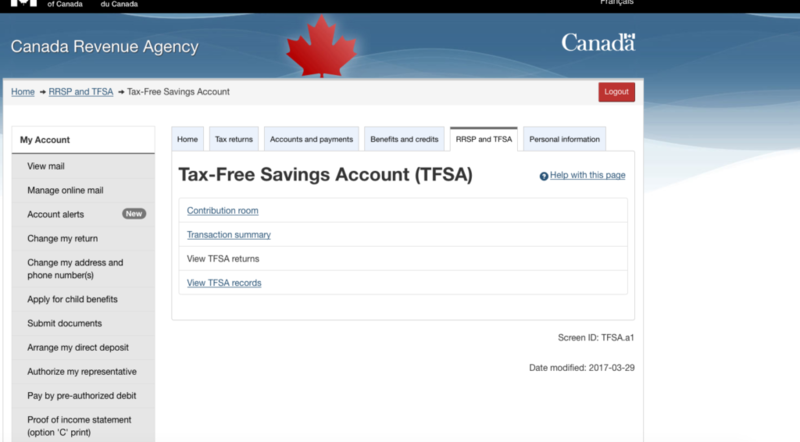 Another tab CRA has which I love more is the RRSP and TFSA tab where it shows your yearly RRSP deduction limit. It gives you’re the exact amount. You can also check your records for the Home Buyers’ Plan and Lifelong Learning Plan if you have one. I don’t. My fav is the TFSA contribution room. It shows your yearly contribution room. For instance, if you have not contributed a single dollar into your TFSA (If this is you, go die! ), your 2017 TFSA contribution room on January 1, 2017 would be $52,000. Screenshot of my personal CRA account. I understand there’s a lot of talk that Canadian millennials aren’t saving enough for retirement and we are worried about our retirement. You may have heard this before but the solutions are you need to start saving early, spend less than what you make and stay out of cc debt. Plain and simple. Your retirement fund will be your BFF come retirement. Think 2047, 2057. Please treat your BFF with love, chocolate and lots of cash. Previous Post What is 5iResearch? Next Post Interview with Brendan Dunlop, Sportsnet Central Anchor.